The cost of construction is rising in Chicago, but contractors are getting smarter about mitigating the impact of such costs. Leopardo, one of Chicago’s largest contractors, discusses the evolving local construction sector and some of the new tech-based solutions that firms are adopting to streamline the building process. To help manage and mitigate the rising cost of construction, the industry is turning to new high-tech systems as well as looking to the past for some very simple processes that have worked well in other industries. The cost of new development is rising in the Chicago area and across the country, driven in part by increasing labor costs and risk-adverse lenders. On the plus side, construction firms are getting better at utilizing technology and lean processes to save time and money while improving the quality of projects. Construction costs increased by about 12 percent over the past five years, and continue to rise despite low commodity prices. The main reason is construction labor cost, which increased 3.59 percent in the 12 months leading up to July, according to CBRE. The Chicago area has experienced some of the steepest increases in the country, averaging nearly 4 percent annually in recent years. The shortage of labor hits less active construction firms the hardest, as larger firms are better able to keep high quality workers busy. Total commercial construction volume in the Chicago metro area reached $3.6 billion in the first half of 2016, a 37 percent increase over 2015, according to Dodge Data & Analytics. We can foresee high volume extending into 2017, as demand for modern big-box industrial space outpaces available supply in some suburban corridors, and ground has been broken on several hotel and multifamily projects in the city. By October, Chicago had issued 40,000 building permits, up 2,000 over 2015, and a record 44 tower projects requiring 48 cranes were under way in December. Office build-to-suits are active as well. One obstacle to speculative construction projects is the national trend of banks pulling away from high-risk real estate lending. New regulations within the Dodd-Frank financial reforms require banks to reserve more cash when making construction loans. As a result, banks are requiring 50 percent or greater equity from developers. Other institutions such as life insurance companies and pension funds are filling the gap with mezzanine financing and equity capital, but these financial structures increase the cost of financing and may limit construction volume in some markets. To help manage and mitigate the rising cost of construction, the industry is turning to new high-tech systems as well as looking to the past for some very simple processes that have worked well in other industries. Building information modeling (BIM) and virtual design and construction (VDC) are helping owners, designers and builders take a virtual look at buildings, spaces and systems while identifying challenges well before product and people show up at the construction site. Today’s technologies are allowing all parties to better understand options and challenges early in design, and verify conditions prior to the first day of construction. “Leopardo has watched virtual technologies improve rapidly over the past five years and has become an educated adopter of these systems to help its entire network of stakeholders better collaborate, which in turn helps the entire construction project team reduce schedules, eliminate waste and manage costs better,” said Leopardo Senior Vice President Michael W. Behm. The integration of lean principles in design and construction has also provided progressive companies and owners the opportunity to better manage costs and schedules using well-tested, low-tech processes utilized in the past by other industries. We have seen many project teams search for opportunities to prefabricate buildings, modules, bathrooms and even partial building systems when the repetitive nature of a design can be created and replicated off-site. Prefabrication can greatly reduce on-site labor costs, facilitate material staging on projects sites and accelerate project schedules. “Over the past few years, Leopardo has immersed its teams in pull planning, a collaborative approach that includes all people who are directly responsible for supervising work on all phases of the project,” Behm said. Owners, designers, contractors and subcontractors all collaborate to work out plans that include the best alternatives for the entire project and team. The goal is to provide predictable and reliable planning that results in a continuous workflow and the elimination of all project wastes, including delays and rework. All these processes help to keep a lid on project costs. Maximizing efficiency can shave tens of thousands of dollars off project costs—maybe not enough to offset rising labor costs, but a significant reduction nonetheless. Another change in our industry is the ever-increasing focus on sustainable building and construction processes. About half of all new construction nationwide is built to Leadership in Energy and Environmental Design (LEED) standards even in cases where owners don’t pursue certification, and many companies are demanding net-zero buildings that have virtually no carbon footprint. In addition, Illinois has adopted new, more stringent energy codes, and machines used in Chicago projects must comply with anti-idling provisions to reduce greenhouse gases and to protect residents from noxious fumes. 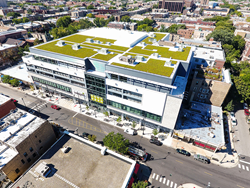 Some Leopardo projects, such as a 265,000-square-foot retail development in Chicago’s Lakeview neighborhood, have gone beyond the city’s mandate by using clean diesel machines that minimize pollution. Sustainability is even more important when building out interior spaces, as most companies now recognize the importance of green offices to enhance worker health, well-being and productivity. Creating these high-performance buildings and interior spaces requires a collaborative team approach to design, construction and operations; thus, this is one more reason for contractors and architects to be well-versed in BIM and other integrated design/development processes. Our industry has been slow to adopt technology and change, but as competition intensifies, many more firms are getting up to speed. Some are adopting technology-based solutions for the first time, while those that have had systems in place for years are integrating new applications and tools that allow teams to communicate, plan and execute projects more effectively. The result is a better end product, delivered with speed and precision, and at a lower cost than would be otherwise possible. As we see labor and material costs continue to rise, these strategies are increasingly vital to ensuring that projects meet or beat client expectations.